We're here to help you communicate expectations and provide resources through each phase of the T-TESS process. Support the overarching goal of continuous improvemeent with ESC Region 13 as your partner. A great way to gain trust and participation in the change process is to describe resources to support successful practices. One way you can do this is by previewing ESC Region 13 resources that are aligned to the T-TESS rubric and share with staff during orientation. As you support your colleagues in goal setting you can access resources and customized support through the ESC 13 Navigator. These resources are available throughout the school year and are accessible within the time frame established for individual plans. As you visit classrooms and observe instructional practices look for patterns of need to guide your selection of resources for staff. This information will be essential in designing professional development for in-service days. During post-conference conversations, look for areas of reinforcement to support continued growth in instructional strengths as well as recommendations for areas of refinement. Using the Resource Navigator you can provide timely information and materials teachers need to reach their goals and support their transition to this new system. 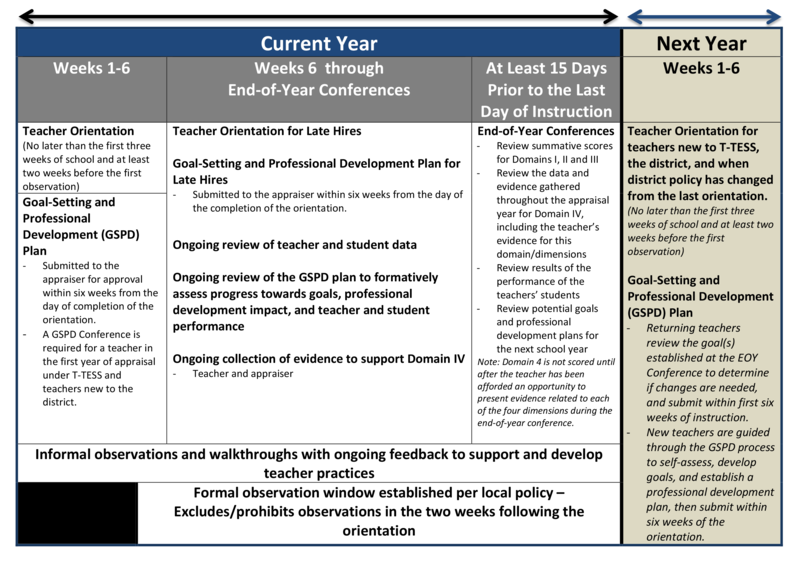 Goal-Setting for year 2 starts with the goals you collaboratively set during the End of Year Conference and will be submitted within the first six weeks of the next school year. With this information you will be able to strategically align summer professional development to improve instruction on your campus.